One of the most enjoyable social applications of a computer network is online video conferencing. Through special applications or Web interfaces, people can set up and join video and audio meetings from their network devices. The term videoconferencing colloquially refers to meetings where actual real-time video feeds or shared or to meetings where desktop screens (such as PowerPoint presentations) are shared. Video conferences can be either scheduled meetings or ad hoc calls. Internet video conferencing systems use online accounts to register people and arrange meeting connections. Video conference applications on business networks are connected to network directory services that establish each person's online identity and can locate each other by name. Many video conference applications enable person-to-person calling by name or underlying IP address. Some applications pop up an on-screen message with a meeting invitation. Online conferencing systems like WebEx generate session IDs and send out URLs to invited participants. Once connected to a session, the video conference application maintains all parties in a multi-party call. Video feeds can be transmitted from a laptop Webcam, a smartphone camera, or an external USB camera. Audio is typically supported, via voice over IP (VoIP) technologies. Besides screen sharing and/or video sharing, other common features of videoconferences include chat, voting buttons, and network file transfer. Microsoft NetMeeting (conf.exe) was the original software application for audio and video conferencing formerly included with Microsoft Windows. It offered sharing of desktop video, audio, chat and file transfer functionality. Microsoft has phased out NetMeeting in favor of their newer Live Meeting service, that in turn was phased out on Microsoft in favor of newer applications like Lync and Skype. Standard network protocols for managing video conferences include H.323 and Session Initialization Protocol (SIP). In computer networking, telepresence is the ability to connect geographically separated people via high-quality real-time video and audio streams. 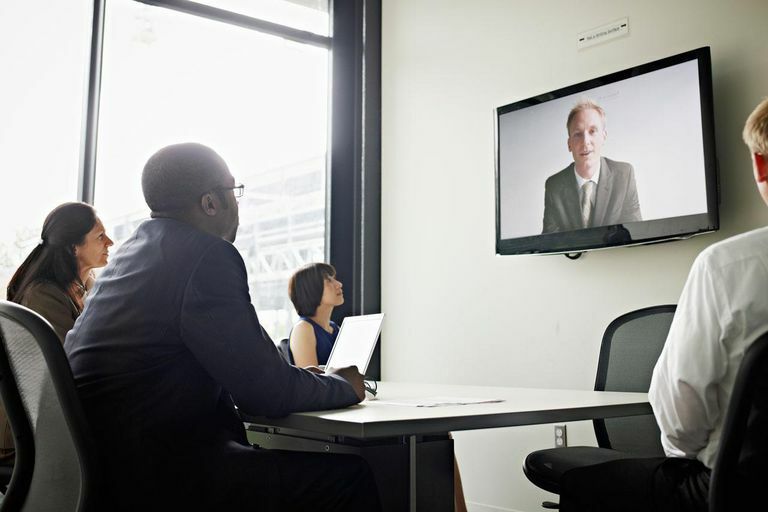 Telepresence systems such as those from Cisco Systems enable long-distance business meetings over high-speed networks. Although business telepresence systems can save money on travel, these products are relatively expensive to purchase and install compared to traditional video conferencing environments. Corporate broadband and Intenet connections can typically support dozens or even hundreds of connected clients with reasonable screen sharing performance and minimal audio glitches as long as real-time video is not being shared. In some older systems like NetMeeting, the performance of a session would be degraded for everyone connected if any one person was using a low-speed connection. Modern systems generally use better synchronization methods that avoid this problem. Real-time video sharing consumes much more network bandwidth than other forms of conferencing. The higher resolution of video being broadcast, the more difficult it is to maintain a reliable stream free of dropped frames or frame corruptions, particularly over Internet connections. What Is VSee and How Is It Used?